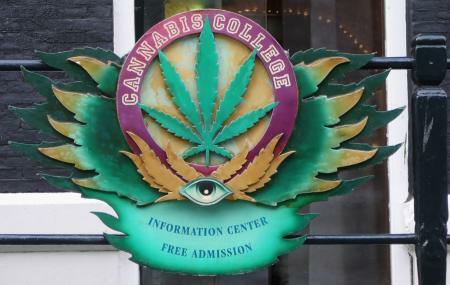 Cannabis College is a great place to visit while you are in Amsterdam. The destination focuses on the effects of marijuana and how today it is used medicinally. Visit the destination and get to know all about the plant there is. There are many fun activities that you can participate in. A quiz about the Cannabis plant is conducted and if you answer 90 percent of the questions correctly then you can get a certificate from the destination. How popular is Cannabis College? People normally club together The Amsterdam Dungeon and Hash Marihuana & Hemp Museum while planning their visit to Cannabis College. Very experienced and friendly people. You can bring your weed and let them look through a microscope. They will rate it and give u some inside tips for great coffee shops. What a great place. In the cold winter it was nice we could go somewhere warm to hang out without being under pressure to buy something. They provide free information about weed and Amsterdam. We should've come here first. For a donation of just 3€, they let us smoke our weed using their vaporisers. Very nice experience. They briefly checked out our weed to make sure it was normal before letting us smoke it here. They also have a microscope which allowed us to see our weed really close. So cool to see. A must stop when in Amsterdam, be sure to check out their garden in the basement the ticket costs 3 EUR but its good for a lifetime. Once you have it you can always come back to smoke for free. (Just bring your own Weed) #NoDrinkRequired You can also check out the vlog of it on: #TheJoSiShow on YouTube! I asked many questions, and was supported with more answers than my medical doctor could even begin to support . Leaned that CBD may be a far better fit for me rather than THC. That is good to know when you are seeking medical support rather than recreational support.